Would a Berniecrat Have Won Ossoff’s Georgia Race? Reams of commentary have been written about the results of the recent special election in Georgia’s 6th Congressional District. Jon Ossoff lost the seat, which was left vacant by Secretary of Health and Human Services Tom Price, to his Republican rival by a margin that was larger than expected. It was the most expensive House race in history, with the two candidates spending a combined $50 million. Republican Karen Handel beat Ossoff by a 3.8 percent margin, winning 51.9 percent of the vote to Ossoff’s 48.1 percent. Ossoff substantially outperformed the Democrats who had run against Price, who typically won by 20-point margins. But despite spending enormous sums on his campaign, he failed to match Hillary Clinton’s 1-point loss to Donald Trump in the same district in 2016. A total of 259,488 votes were cast. Handel won with a margin of less than 10,000 votes – 9,702. That means a shift of only 9,703 votes would have changed the outcome. Remember that figure. Virtually all the commentary that has been written about this race was based on the assumption that this district is white, wealthier than average, and “a safe Republican seat.” Ossoff’s campaign appeared to share this assumption. Ossoff ran as a “Republican Lite,” demonizing government service and downplaying bread-and-butter Democratic issues. Ossoff even talked about “bringing the government up to private-sector standards.” He presumably was not thinking of the “standards” that caused the BP oil spill or the Wall Street financial crisis of 2008. But was his underlying assumption true? Do you have to run like a Republican to win in a district like the Georgia 6th? The Census Bureau publishes searchable data online for every congressional district, but very few commentators seem to have taken advantage of this free resource. The same seems to be true of the Democratic consultants who helped themselves to some of the $20 million in campaign funds Ossoff spent. 82,355 households in the 6th earn less than the national average in yearly income. It’s true that this is a wealthier-then-average district – but that’s an average. These households earn less than the national average of $51,000 a year. The voters who live in these households were never told that the Democratic candidate would fight to increase their wages, give them better benefits, or do more to make the necessities of living more affordable. And Ossoff studiously avoided class or economic inequality, refusing to support tax increases even for the wealthiest Americans. 77,658 residents had no health insurance coverage at all. That’s after the Affordable Care Act had been in effect for year. During the campaign, these voters were never told that healthcare is a basic human right, or that Medicare For All could provide them with the medical care they need. Instead, Ossoff said that he did not support single-payer healthcare. 81,376 voters are 65 years of age or older. The Trumpcare bill Karen Handel supports slashes revenue for Medicare, laying the groundwork for deep cuts further down the road. The Medicaid cuts pushed by Trump and his fellow Republicans would eliminate a major source of funding for the nursing home care used by many seniors. And Trump’s budget would cut billions in funding from Social Security. Ossoff could have run on strengthening Medicare’s funding and expanding Social Security to meet our nation’s retirement crisis. Instead, he chose to soft-pedal these issues, even though seniors are more likely than other eligible voters to show up at the polls on Election Day. Despite the district’s large black population, Ossoff did very little outreach to black voters. He spent heavily on television advertising and very little on get-out-the-vote (GOTV) efforts in predominantly African-American communities. He did not discuss racism, either individual or structural. African-American working people struggle with the same burdens as workers of other races, and black college graduates have been especially ill-served by our system of student indebtedness. His silence on these issues undoubtedly also affected turnout in this group. Again, it appears Ossoff conducted very little outreach to this group. Hispanics struggle with wage inequality, access to medical care, and environmental concerns, while struggling with issues of bigotry and hatred that have been inflamed by the current president and his party. 88,230 people in this district are between the ages of 45 and 64. Many of these Georgians will be severely harmed financially if “Trumpcare,” the Republican plan to repeal and replace Obamacare, becomes law. Many “Medicare for All” proposals, on the other hand, suggest a phased-in approach that begins by making Medicare available to people 55 and older; some include younger ages as well. Ossoff opposed Medicare for All. He also opposed Trumpcare, but did not make it a centerpiece of his campaign. His healthcare comments were often rhetorically indistinguishable from that of many Republicans, a point he emphasized himself early in the campaign. “Responsible leaders of both parties agree that no American should face financial ruin, suffer or die because they have a pre-existing condition,” Ossoff told an Atlanta newspaper early in the campaign. Issues of wage stagnation have hit this age group heavily, but Ossoff did not run on raising wages or government investment in job growth. 131,586 people in the district are between the ages of 20 and 34. Voters of all ages are struggling with the burden of student debt, but this age group has been hit especially hard. Total student debt in this country now exceeds $1.4 trillion, yet Ossoff did not make the issue a centerpiece of his campaign. The debt issue has been made even worse for millennial college grads by the fact that they graduated into a weak job market. Ossoff could have campaigned on a platform of tuition-free higher education, combined with relief for student debt holders and a program for creating jobs and raising wages. And yet, despite the fact this this district includes many college graduates, he chose not to. 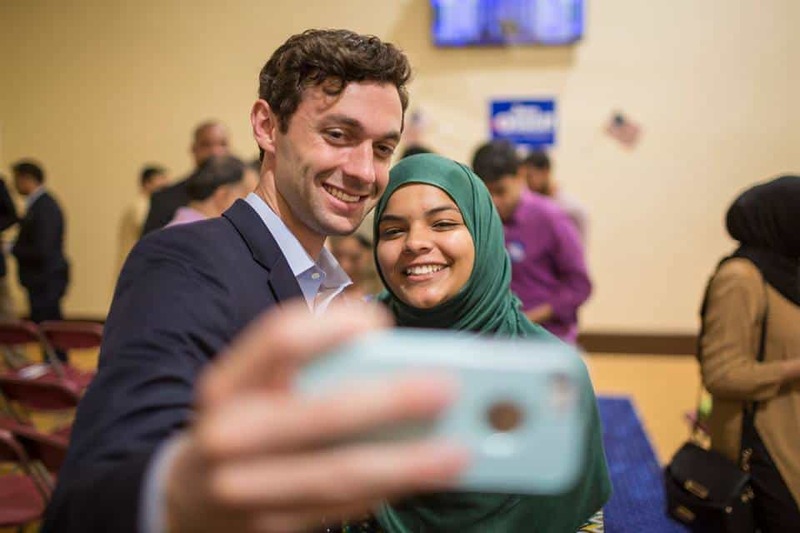 Ossoff did not emphasize immigrants’ rights or equality and social justice for ethnic and religious minorities. He did not speak out forcefully against Trump’s attempted Muslim ban or his demonization of Hispanics. 46,214 voting-age residents are disabled. Trump, together with his Republican colleagues on Capitol Hill, is trying to slash Social Security disability. Trumpcare would have a devastating impact on disabled Americans. 63,123 residents work in educational services, health care, and social assistance. 29,736 are government workers. Another 9,238 work in public administration. That’s 102,097 people whose jobs are on the cutting block when Republicans are in power. A strong progressive agenda, by contrast, would emphasize smart, targeted spending increases in these areas. There are 130,472 housing units with mortgages in the district. Since many of those mortgages are held by couples, means there are even more voters who write checks to a bank every month. The Consumer Financial Protection Bureau (CFPB) protects their interests; a modern-day Glass Steagall Act, and a breakup of the biggest banks, would protect them even more. What, if anything, does Ossoff’s loss mean for the Democratic Party going forward? While the answer is speculative by necessity, the answer is: It could mean quite a lot. Even in their worst years, the Democratic congressional candidate in this district has received 38 percent of the vote. That’s the Democrats’ foundation. What will get them from there to the finish line? Remember, less than ten thousand votes would’ve made the difference for Ossoff. A campaign based on economic populism and a strong commitment to civil rights – that is, a “Berniecrat” campaign – could arguably have turned out many thousands of voters who stayed home this time around, while swaying others to the Democratic column. The Ossoff campaign would have been wise to spend less on television buys and invest a lot more in doorbell-ringing and other forms of voter-to-voter outreach. That could have proved especially critical in communities of color and among workers who are struggling economically. Would this strategy have succeeded in the Ossoff race? We can’t know, of course. But we do know this: what the Democrats have been doing has failed. That’s why insiders and party activists must ignore the voices of those who created this mess in the first place. That includes Rahm Emmanuel and Bruce Reed, who argued recently that Trump hatred alone will lift the party to victory in 2018. “Democrats don’t need to spend the next year navel-gazing over how to motivate their base,” they sneer. “Navel-gazing” is apparently a snarky term for any analysis that doesn’t promote your personal interests. The party has lost more than 900 state legislature seats since 2009, according to some measures. It has lost both houses of Congress, along with two thirds of statehouses and two thirds of governorships. It has remained largely silent and impotent as Republicans rig the game in their favor through gerrymandering and voter suppression. Something needs to change. The party must turn sharply left on both economic and social issues if it is to have a chance of regaining Congress in the future. If it does that, it will also be taking a stand on principle for the first time in a generation. The value of political courage is something that numbers alone can’t measure.